In Thursday, April 11, trading in the euro / dollar closed lower. The euro fell to 1.1250. For me it was a downward correction in relation to the upward movement. Strengthening of the dollar contributed to the American statistics and dynamics of return in the US 10-year bond, which has grown. Producer Price Index and a decrease in the number of applications for the grant of unemployment in the US have reduced the likelihood of the Fed lowering rates, the messengers. At 12:00, the euro zone is to publish data on the change in the volume of industrial production for February. At 15:30 in the US will import price index for March, at 17:00 - the index of consumer sentiment from the University of Michigan for April. At 20:00 Baker Hughes to publish data on the number of active drilling rigs for oil production. Support 1,1249-1,1255 resisted. It was followed by a sharp rise in EUR / USD pair to 1.1295. 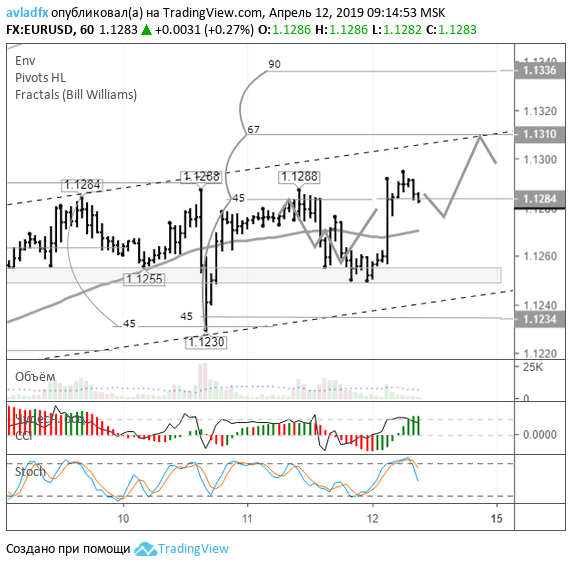 According to the technique of growth of EUR / USD was expected, but it was caused not by technical factors, and news. It does not interfere. Stars are in the sky well for a rebound. Federal Reserve Board will probably refuse to consider candidates Herman Cain (Herman Cain) for the position of the regulator. Donald Trump saw him as a candidate for one of the seats in the Board of Governors of the Federal Reserve. He was dissatisfied with the US Federal Reserve decided to raise the regulator manual as many of their people can be.